Find artworks, auction results, sale prices and pictures of Ronay at auctions worldwide. 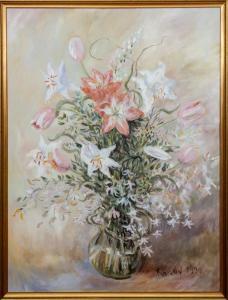 Oil on canvas, 1990, signed 'Ronay' and dated lower right. 39 1/2 x 29 1/2 in. (sight), 42 1/2 x 32 1/2 x 3 in. (frame).